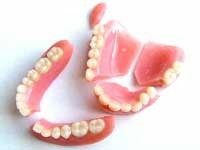 Denture Repairs While You Wait! Repairs may be required when breakage or chipping occurs, when one or more teeth need to be added to an existing partial or complete denture or because of wear and tear. We can restore your existing broken or cracked denture to its original state while you wait.